Bordered by Nepal, Tibet and Bhutan and influenced by all three, the former kingdom of Sikkim is a bastion of the Buddhist religion. The least populated state in all of India it is a modern day utopia boasting some incredible biodiversity. The Hotel Guru's selection of the best places to stay in Sikkim is wide ranging - from heritage to back to nature there are plenty of options. From the rhododendron valleys of Yumthang in the north, to picturesque Pelling, there is plenty to see and do. One quarter of the state is covered by the Khangchendzonga National Park, home to the Zemu glacier plus four legged creatures such as the elusive snow leopard, red pandas, musk deer and the Himalayan tahr. Gangtok, the state’s capital, is a cultural hub and a mix of modern concrete structures with stunning mountain views. A friendly and manageable capital city, Gangtok is a pleasant stay for a few days. Make sure to visit the Namgyal Institute of Tibetology. Housed in a traditional Tibetan style mansion it has a comprehensive collection of Buddhist and Tibetan artefacts. To sample some of Sikkim’s famous teas stop for a cuppa at Golden Tips in Gangtok: a chai institution. The landscape. That is why travellers visit Pelling. From the unforgettable views of Khangchendzonga and the waterfalls at sunrise, to the sacred Khechoedpaldri hills its beauty is all encompassing. June to September welcomes the monsoon but not the travellers. Visit Sikkim between November and May for optimum weather. October through to December sees clear blue skies whilst the spring months of April and May are when a blanket of rhododendrons are in full bloom. Just remember that in the peak months, the best places to stay in Sikkim will be busy. So plan your trip, and book well in advance. Surrounded by the Himalayas, Norbu Ghang Retreat in Pelling has several balconies where guests can relax, unwind and make the most of some stunning views. Cosy rooms are pine clad and feature open fires and large bathrooms with Jacuzzi tubs. 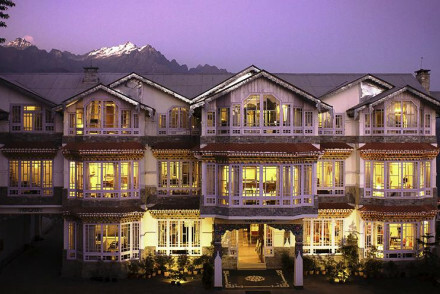 The former abode of the Sikkamese royal family in Gangtok, the Elgin Nor-Khill Hotel is a regal stay. Painstakingly decorated with period furniture, the cosy bedrooms and picturesque gardens make it a delightful stay. The indulgent Elgin spa completes the package. As the name suggests, Mayfair Spa Resort and Casino even has a casino! There is a spa, pool, kids club and fine dining. Accommodation is made up of private villas meaning it is great for the whole family. 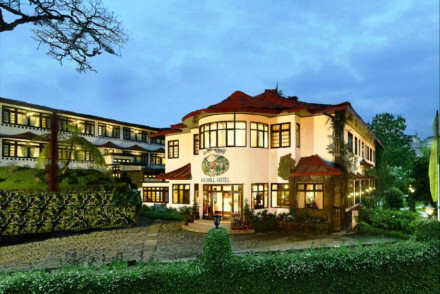 An idyllic retreat outside, yet within easy reach, of Gangtok’s centre. Visit Sikkim during the spring months (March - April) when you'll find cool nights and bright days or the summer months (May - June) where temperatures reach 22°C. The monsoon arrives in July and runs through to September. Nearest airport for Sikkim is Bagdogra, near Siliguri in North Bengal, which is 124 km and approximately four hours drive from Gangtok. The closest railway stations are Siliguri and New Jalpaiguri. Both of these have a number of trains connecting them to Kolkata. From family to heritage browse though our list of the best places to stay in Sikkim to start to plan your trip. Widen your search to include all our options in neighbouring, West Bengal. Memorable views and a serene stay await. Take in the captivating Himalayan scenery while sipping tea on your private balcony. Wood-panelled rooms are an inviting blend of modernity and comfort. Unwind in the sauna or hot tub, enjoy a massage, or dine on tantalising local and international cuisine. Sights nearby - Just a 15-minute drive from the historic Buddhist Pemayangtse Monastery. Dignified former royal guesthouse lovingly decorated with period furniture, regional symbolic motifs and vibrant hues. Luxuriate in cosy bedrooms with views onto picturesque gardens and mountains. Savour unique local dishes at the in-house Sikkimese restaurant, and be pampererd at the Elgin spa. Kids Club - Fully staffed. Idyllic retreat in stunning mountainscape. Well-appointed rooms tastefully furnished with polished wood and soothing colours. Villas offer privacy and luxury. 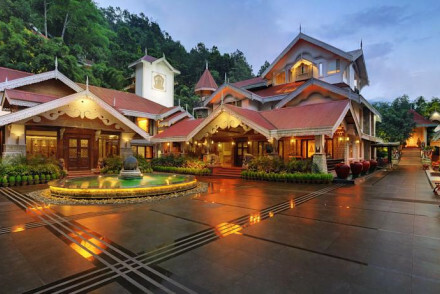 Architecturally reminiscent of Sikkimese tradition but with a modern twist. Spa, pool, casino, kids club. Enjoy delicious food with a view.